Just as it promised yesterday during Windows 10′s big unveil, Microsoft has now made a Technical Preview of the new operating system available to download for those who are interested. This is probably best thought of as a pre-beta release, so only the truly adventurous need apply. To download, you first need to join the new Windows Insider Program. The Insider Program will allow you to have an active role in helping Microsoft build Windows 10. The Technical Preview will get updated builds, and you’ll receive these as soon as they’re available. The Preview comes with the Windows Feedback app (pictured above) through which you can report any issues or bugs that you encounter while using the new OS. 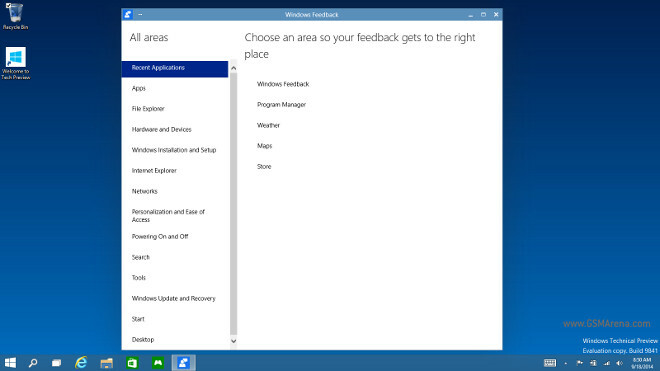 It also lets you make suggestions to Microsoft, telling the company what you like and don’t like about Windows 10. The Windows 10 Technical Preview Forum is where you’ll be able to ask questions about the new release and talk about it with other participants in the Insider Program as well as Microsoft employees. Obviously, you should expect to see many bugs in this Technical Preview build of Windows 10 (and even in the ones that will come later as updates). That’s the thing with using pre-release software, so make sure you’re comfortable with this prospect before you install it. Microsoft has a FAQ nicely laid out if you’re unsure whether this is for you. There’s also a Quick Guide to the new features in Windows 10 available as a PDF. The Windows 10 Technical Preview will expire on April 15, 2015, so you won’t be able to use it after that. Microsoft will start sending you notifications beginning on April 1, 2015, to remind you about this fact. The Preview is available in English, Chinese Simplified, and Brazilian Portuguese.